We discovered Mara quite by accident about a few years ago. 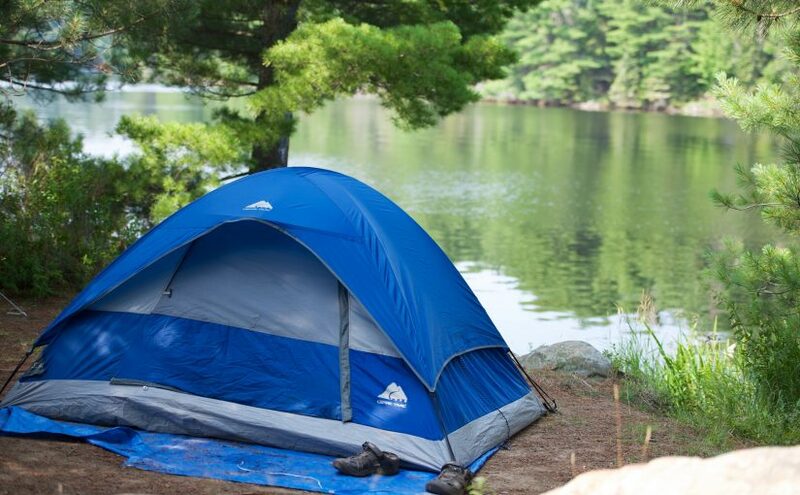 We love a good camping getaway but not long road trips in an overstuffed minivan. We often head to the Orillia area, only a half hour drive away from our home, our theory being once you’re sitting around a campfire in the woods you feel like you’re a hundred miles away. 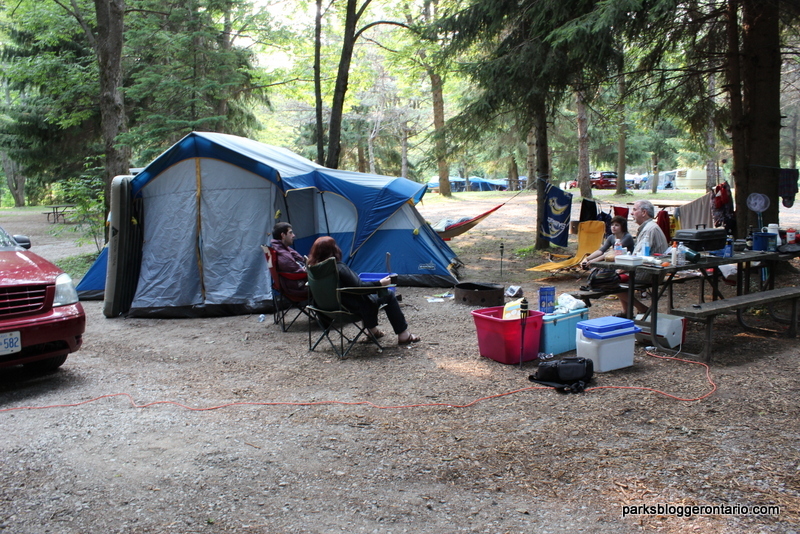 Bass Lake Provincial Park was our go-to park for several seasons until one day it was booked solid. So we booked our first Mara trip for site #99. Number 99 is in what most would call ‘The Loop’, a circle in the farthest corner of the park. It is in the shadiest, thickest part of the natural forest and reached by crossing a bridge over swampy waterway, solid green with duckweed. A blue heron can be found standing in the water most mornings, breakfasting on the abundance of frogs and crayfish found there. Most summers, my sister and her family join us for camping. Lately, we are more likely to be found in the central part of the park within easy walking distance to the modern brick comfort building. You will find clean bathrooms and hot showers there. The beach too is little more than a five minute walk away. One of the nice things about Mara is its size. It is quite small. 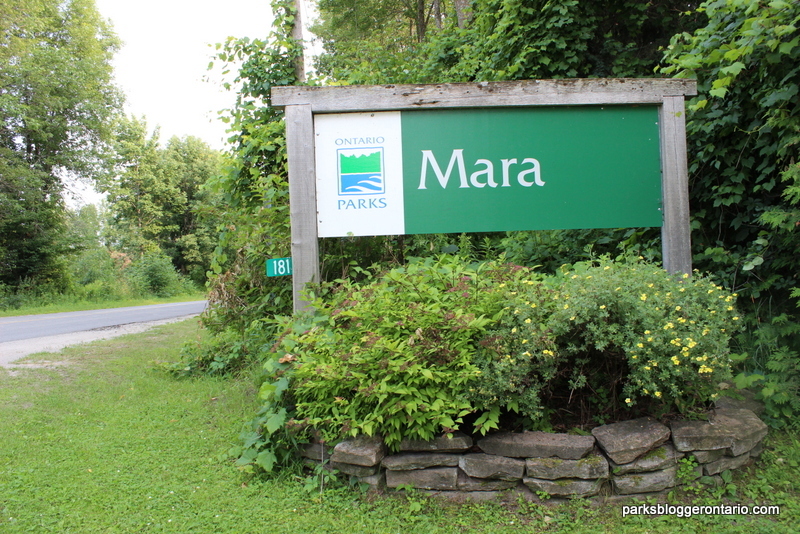 Compared to some of the bigger provincial parks, where the beach is a long hike or even a car ride away, Mara is very walkable. This is a bonus if you have small children. This year, I accidentally booked an electrical site, #47, but my technology mad family was quite thrilled that they could now charge their cell phones. My sister booked late, but had no trouble getting nearby site #6. 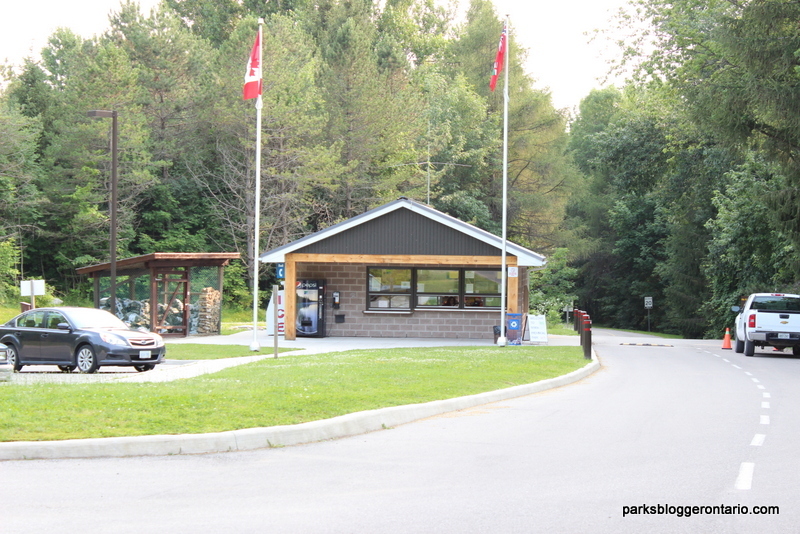 Both sites were great – large, flat, and dry with two picnic tables, a fire pit with grill and adequate shade. All set up and enjoying the outdoors at site #47. 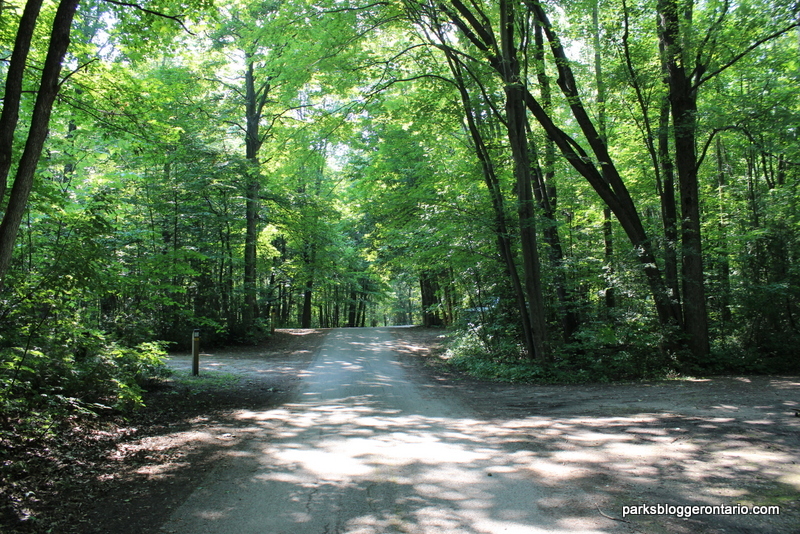 A shady roadway runs past some vacant camp sites. On our first night out, we grilled hamburgers directly on the fire pit grill. This cooking method is another one of our happy accidents. We once forgot to bring our portable barbecue and now flame broiling has now become the method of choice for most of our cooking. Canned veggies require no pot. Open the can and set on the grill. Try paninis too! After dark, cold beers and coolers were passed around and the kids broke open the chips and s’more ingredients. A little shop in Orillia sells a Hungarian sausage known as csabai (pronounced ‘chubba’) and over the years, it has become a must-do to grab some for roasting over the fire whenever we camp at Mara. Breakfast is a big deal with our crew. Everybody wants to know what we brought! The cooler, this time, offered breakfast sausages, sliced bacon, eggs, hash browns milk and assorted vegetables. After breakfast, the gang always has one thing on their minds – beach! Mara has a wonderful sandy beach, surprisingly large for a small park. 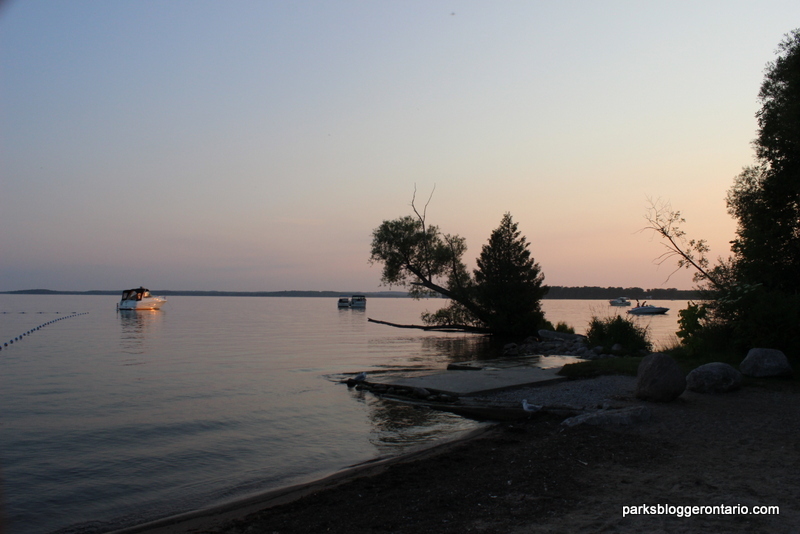 The crystal waters warm up quickly each year and there’s nothing better than a dip in an Ontario lake to de-stress and let your cares float away. 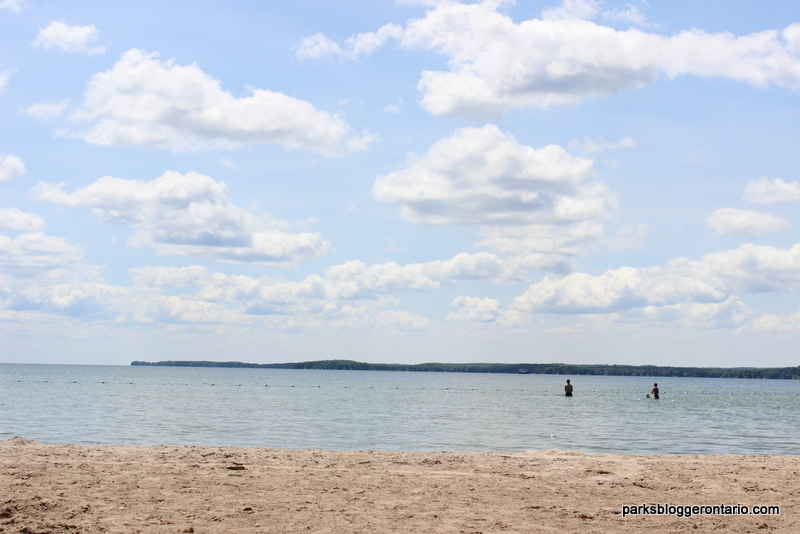 Mara’s beach must be a natural beach, as a sandbar reaches quite far out into Lake Simcoe from the shore. Mara is located nearly at the northernmost tip of Simcoe a the Narrows which is a slim waterway joining it to smaller Lake Couchiching. Families love the wide, clean beach with its shallow water. 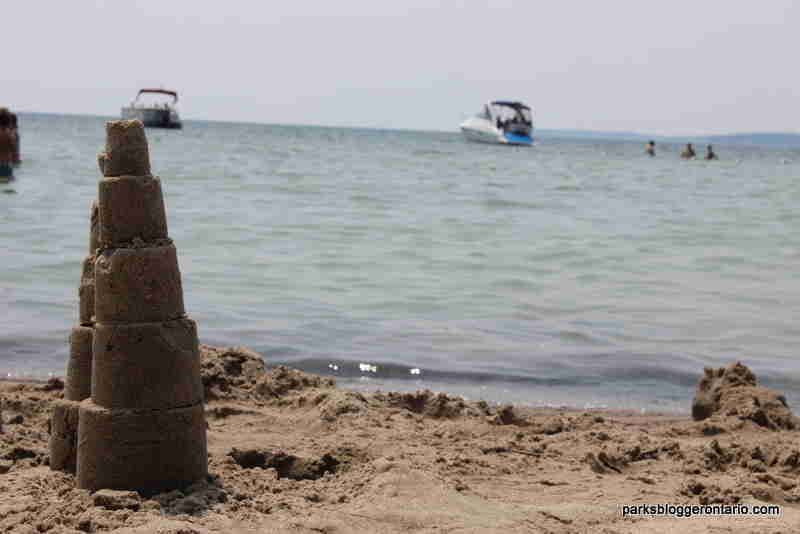 Sand castle construction by the warm, clear waters of Lake Simcoe, at Mara Beach. On the north end of the beach, there is a small islet with a decidedly south leaning willow tree. This spot is definitely the most photographed scene at Mara. The little island is at the mouth of the same creek that winds its way through the park and through ‘The Loop’. A lovely nature trail follows the water and we have seen many wonderful local creatures here in the past including owl, beaver, turtles, snakes, salamander, ducks and thousands of frogs. Sadly, the tent must come down some time and the camp chairs stowed in their bags once again. The sun was still shining through the trees when we dismantled our campsite. The birds still sang and the red squirrel continued to harass the chipmunks, but real life beckoned. Jobs, laundry, cats, medical appointments waited for us at home and the woods had to be left behind for another time. I am always a bit sad to leave. We always make a half plan to come back again later in the season, but it never happens. There simply aren’t enough weeks in a Canadian summer. As soon as we can, we will return to this little gem and spend a few more golden days in the forest.